Dental implants have been hailed as one of the truly great advances in the field of dentistry, and with good reason. 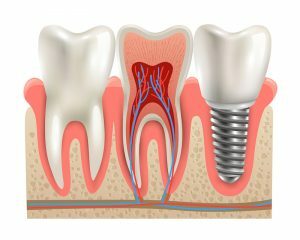 Implants are an artificial tooth root that is surgically implanted into the jaw of a patient, to replace a missing root. The implant, in turn, can support an artificial tooth; multiple implants can anchor a set of dentures. Dental implants are available from Boulder County Smiles in Lafayette CO. But first, there are times when we have to take a moment and marvel at human ingenuity. The idea of dental implants actually goes back at least a thousand years. Ancient implants were a far cry from what we know today: sea shells, pieces of metal, and even bits of bone were placed in the patient’s jaw. We don’t know if any of them were any good, but the idea was there. Dental implants from Boulder County Smiles in Lafayette are the closest thing to getting back a natural tooth. Find out more by scheduling a consultation today. We also provide general and family dentistry, and pediatric dentistry.